I am writing in regard to Professor Bart Christner, an applicant for a full time instructor position in your Department of Digital Media. Bart Christner has earned the respect and affection of many students and colleagues throughout his five year career at Daytona State College, and has distinguished himself as being a top instructor. I have known Bart Christner for approximately five years, participating together to some College initiatives, as well as developing a good friendship. 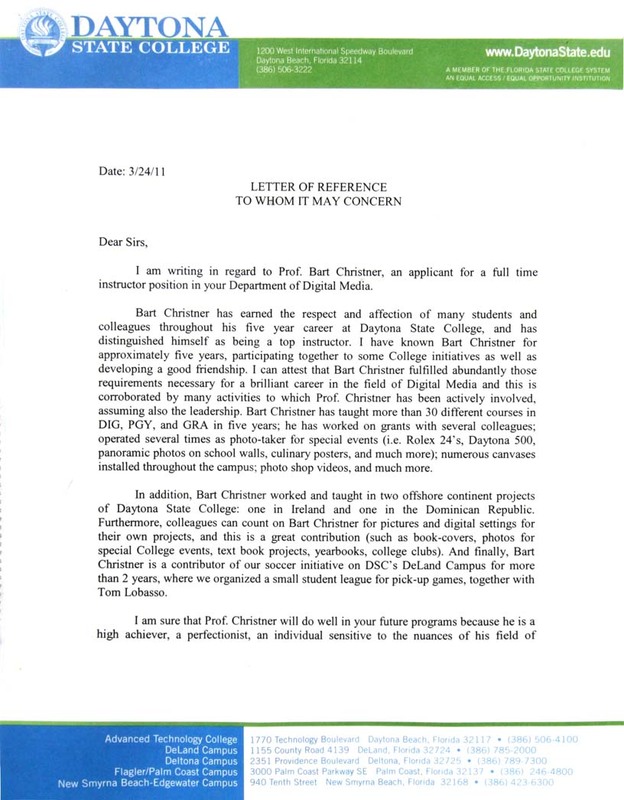 I can attest that Bart Chirstner fulfilled abundantly those requirements necessary for a brilliant career in the field of Digital Media and this is corroborated by many activities to which Professor Christner has been actively involved, assuming also the leadership. Bart Christner has taught more than 30 different courses in DIG, PGY, and GRA in five years; he has worked on grants with several colleagues; operated several times as photo-taker for special events (i.e. Rolex 24's, Daytona 500, panoramic photos on school walls, cullinary posters, and much more); numerous canvases installed throughout the campus; Photoshop videos, and much more. In addition, Bart Chirstner worked and taught in two offshore continent projects of Daytona State College: one in Ireland and one in the Dominican Republic. Furthermore, colleagues can count on Bart Christner for pictures and digital settings for their own projects, and this is a great contribution (such as book-covers, photos for special College events, text book projects, yearbooks, college clubs). And finally, Bart Christner is contributor of our soccer initiative on DSC's DeLand Campus for more than two years, where we organized a small student league for pick-up games, together with Tom Lobasso. I am sure that Professor Christner will do well in your future programs becasue he is a high achiever, a perfectionist, an individual sensitive to the nuances of his field of expertise, as well to those of common everyday life. His mannrs are always pleasant, and always finds time to spend with students and colleagues. He shows initiative, leadership and responsibility, along with the aptitude for academic work. It is my earnest belief that this individual shall incontestably bring to your institution the dignity and respectability of a very competent and prepared instructor. 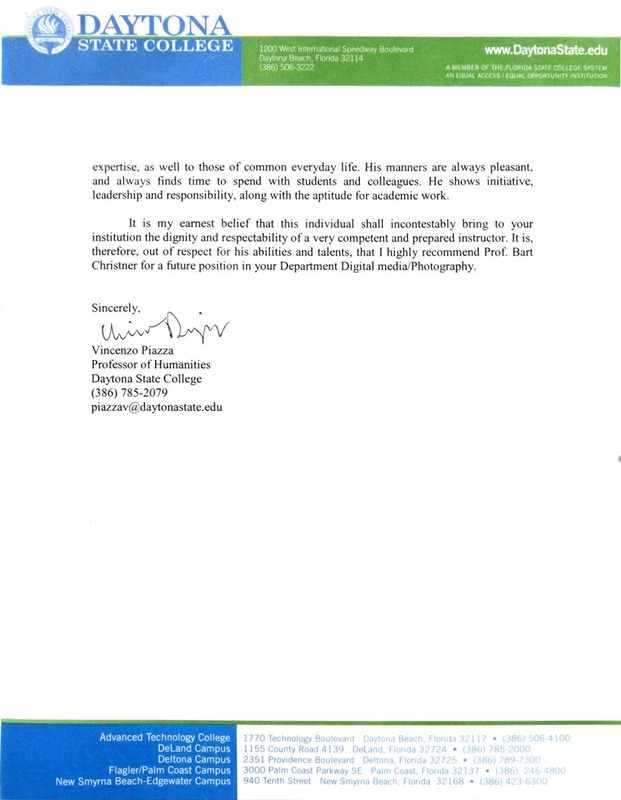 It is, therefore, out of respect for his abilities and talents, that I highly recommend Professor Bart Christner for a future position in your Department Digital Media/Photography.